Royal Dutch Shell plc, commonly known simply as Shell, is a multinational oil company of Dutch and British origins. It is the second largest private sector energy corporation in the world, and one of the six "supermajors" (vertically integrated private sector oil exploration, natural gas, and petroleum product marketing companies). 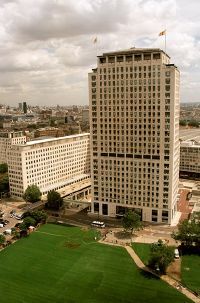 The company's headquarters are in The Hague, Netherlands, with its registered office in London (Shell Centre). The company's main business is the exploration for and the production, processing, transportation and marketing of hydrocarbons (oil and gas). Shell also has a significant petrochemicals business (Shell Chemicals), and an embryonic renewable energy sector developing wind, hydrogen and solar power opportunities. Shell is incorporated in the UK with its corporate headquarters in The Hague, its tax residence is in Netherlands, and its primary listings are on the London Stock Exchange and Euronext Amsterdam (only "A" shares are part of the AEX index). In 2007, Forbes Global 2000 ranked Shell the eighth largest company in the world. Also in 2007, Fortune magazine ranked Shell as the third-largest corporation in the world, after Wal-Mart and ExxonMobil. Shell operates in over 140 countries. Its Shell Oil Company subsidiary in the United States, headquartered in Houston, Texas, is one of Shell's largest businesses. As a result of its activities worldwide, Shell has been at the center of a number of controversies concerning business practices, involvement in local politics, ethical and environmental issues. The Royal Dutch Shell Group of companies was created Royal Dutch Petroleum Company was a Dutch company founded in 1890 by Jean Baptiste August Kessler, along with Henri Deterding and Hugo Loudon, when a Royal charter was granted by king William III of the Netherlands to a small oil exploration company known as "Royal Dutch Company for the Exploration of Petroleum Wells in the Dutch Indies" (Koninklijke Nederlandsche Maatschappij tot Exploitatie van Petroleumbronnen in Nederlandsch-Indië). The company established its first pipeline and refinery in Sumatra in 1892, processing petroleum from local oil fields. In 1896, under the leadership of Hendrik W.A. Deterding (1866–1939), it began to build oil tankers and storage facilities and create a sales organization. By 1907, the company had developed a tanker fleet which allowed it to compete with “Shell” Transport and Trading Company, Ltd..
Marcus Samuel (1853 – 1927), the founder of “Shell” Transport and Trading Company, Ltd, was born into a Jewish family in Whitechapel, London. His father, also Marcus Samuel, ran a successful import-export business, M. Samuel & Co., trading with the Far East, which Marcus carried on with his brother, Samuel Samuel. Marcus Samuel realized the potential of the oil trade during a trip to the Black Sea in 1890, and ordered the construction of eight dedicated tankers, the first purpose-built tanker ships ever made. The first to be launched was the Murex (Latin for a type of snail shell), under the command of Captain John R. Coundon. These were the first such ships to satisfy the Suez Canal company of their safety, allowing Samuel to ship his product to Bangkok and Singapore. In 1896 he set up oil wells and refineries in Borneo, and in 1897 he established a separate company in the United Kingdom, the “Shell” Transport and Trading Company, Limited (the quotation marks were part of the legal name). By 1907 the company had a fleet and had contracted for petroleum supplies in Sumatra, Texas, Russia, Romania and other locations. In 1903, Royal Dutch and “Shell” companies decided to integrate their distribution and sales operations for petroleum produced in the East Indies and marketed in the Far East. In February, 1907, largely driven by the need to compete globally with the then-predominant American oil company, John D. Rockefeller's Standard Oil, the Royal Dutch Petroleum Company (legal name in Dutch, N.V. Koninklijke Nederlandsche Petroleum Maatschappij) and the "Shell" Transport and Trading Company Ltd of the United Kingdom merged their operations. The new Royal Dutch/Shell Group was headed by two parent companies, with Deterding as general managing director. The terms of the merger gave 60 percentof the new Group to the Dutch arm and 40% to the British. The United Kingdom created Marcus Samuel, the founder of “Shell” Transport and Trading Company, 1st Baron Bearsted of Maidstone in the County of Kent in the 1921 Birthday Honours, in recognition of Shell's contribution to the British cause during World War I. In 1919, Shell took control of the Mexican Eagle Petroleum Company and in 1921 formed Shell-Mex Limited which marketed products under the "Shell" and "Eagle" brands in the United Kingdom. The Group's principal American subsidiary, Shell Oil Company, was founded in 1922. In 1931, partly in response to the difficult economic conditions of the times, Shell-Mex merged its UK marketing operations with those of British Petroleum to create Shell-Mex and BP Ltd., a company that traded until the brands separated in 1975. In 1949, Royal Dutch Shell shortened its corporate title to Shell. “Shell” Transport and Trading Company became a public limited company in 1981. After World War II, new advances in technology and manufacturing increased the worldwide demand for petroleum products, and Shell expanded rapidly. The first supertankers were built to facilitate the transfer of crude oil, and refineries were built close to the markets they would be serving. 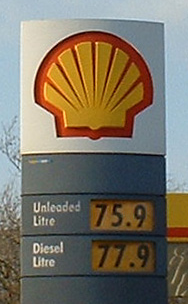 In November 2004, following a period of turmoil caused by the revelation that Shell had been overstating its oil reserves, it was announced that the Shell Group would move to a single capital structure, creating a new parent company to be named Royal Dutch Shell PLC, with its principal listing on the London Stock Exchange and the Amsterdam Stock Exchange and its headquarters and tax residency in The Hague in the Netherlands. The unification was completed on July 20, 2005. Shares were issued at a 60/40 advantage for the shareholders of Royal Dutch in line with the original ownership of the Shell Group. Under the old capital structure, Shell's ADRs (American Depositary Receipts) were traded on the New York Stock Exchange as RD (Royal Dutch) and SC (Shell). The brand name “Shell” is linked to the origins of the “Shell” Transport and Trading Company. In 1833, the founder's father, also Marcus Samuel, founded an import business to sell seashells to London collectors. While he was collecting seashell specimens in the Caspian Sea area in 1890, the younger Samuel realized there was potential to export lamp oil from the region. In 1897 he formed “Shell” Transport and Trading Company, named after his first business, which sold painted seashells. The Shell brand is one of the most familiar commercial symbols in the world. Known as the "pecten" after the sea shell Pecten maximus (the giant scallop), on which its design is based, the current version of the logo was designed by Raymond Loewy and introduced in 1971. The yellow and red colors used are thought to relate to the colors of the flag of Spain because Shell built early service stations in the state of California which had strong connections with Spain. Royal Dutch/Shell is the world's second-largest private sector oil company by revenue, Europe's largest energy group and a major player in the petrochemical industry. It was one of the original Seven Sisters, a cartel of oil companies including Standard Oil of New Jersey (ExxonMobil), Anglo-Persian Oil Company (APOC, later BP), Standard Oil Co. of New York (Mobil, now part of ExxonMobil), Standard Oil of California (Chevron, Gulf Oil, and Texaco. The Seven Sisters dominated mid-20th century oil production, refining, and distribution until OPEC gained strength during the 1960s. Shell has five core businesses: Exploration and Production (the "upstream"), Gas and Power, Refining and Marketing, Chemicals (the refining and marketing of petroleum products and chemicals makes up the "downstream"), and Trading/Shipping, and operates in more than 140 countries. Shell's primary business is the management of a vertically integrated oil company. The development of technical and commercial expertise in all the stages of this vertical integration from the initial search for oil (exploration) through its harvesting (production), transportation, refining and finally trading and marketing, established the core competencies on which the Group was founded. Shell applied this expertise to the production and distribution of natural gas, which now contributes a significant proportion of the company's profits. The vertically integrated business model gave significant economies of scale and provided Shell with the opportunity to establish barriers to entry both geographically and on a global level in certain sectors of the market. Recently vertical integration has become less viable, and though the structure remains, there is much less interdependence among the businesses. Shell's oil and gas business is increasingly an assembly of independent and globally managed business segments, each of which must be profitable in its own right. The “downstream,” which also includes the Chemicals business, generates a third of Shell's profits worldwide and is most recognized by its global networks of more than 40,000 petrol stations and its 47 oil refineries. Shell has occasionally sought to diversify its core oil, gas and chemicals businesses. These diversifications have included a short-lived and costly joint venture into nuclear power with Gulf Oil in the USA; coal (Shell Coal was for a time a significant player in mining and marketing); metals (Shell acquired the Dutch metals-mining company Billiton in 1970) and electricity generation (a joint venture with Bechtel called Intergen). None of these ventures were seen as successful and all have now been divested. In the early 2000s Shell moved into alternative energy and there is now an embryonic "Renewables" business that has made investments in solar power, wind power, hydrogen, and forestry. The forestry business, like the nuclear, coal, metals and electricity generation, was divested in 2003. In 2006 Shell sold its entire solar business and in 2008, the company withdrew from the London Array which is expected to become the world's largest offshore wind farm. Shell holds 50 percent of Raízen, a joint venture with Brazilian sugarcane producer Cosan which is the third-largest Brazil-based energy company by revenues and a major producer of ethanol. Traditionally, Shell was a heavily decentralized business worldwide (especially in the “downstream”) with companies operating in over 100 countries with a considerable degree of independence. The “upstream” tended to be more centralized, receiving detailed technical and financial direction from the central offices in The Hague. In a small number of major oil and gas production centers such as the United Kingdom (Shell Expro, a Joint Venture with Exxon), Nigeria, Brunei, and Oman Shell established large "Exploration and Production" companies. The “downstream” business, which in some countries also included oil refining, typically consisted of a retail petrol station network, lubricants manufacture and marketing, industrial fuel and lubricants sales and a host of other product/market sectors such as LPG, and bitumen. The custom and practice in Shell was that these businesses were essentially local in character and that they were best managed by local "operating companies" – often with middle and senior management reinforced by expatriates. In the 1990s the independence of operating companies around the world was gradually reduced and today directly-managed "global businesses" have been created in all sectors. London is the headquarters of the “downstream” and other businesses and services, while the “upstream” business is primarily managed from the offices in The Hague. 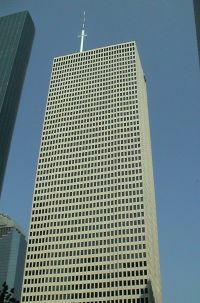 One Shell Plaza, Shell Oil Company's headquarters in Houston. The United States-based affiliate of Royal Dutch Shell, Shell Oil Company, has its headquarters in Houston, Texas and employs approximately 22,000 workers in 50 states. Including its consolidated companies, affiliates and its share in the equity of other companies, it is one of America’s largest oil and natural gas producers, natural gas marketers, gasoline marketers and petrochemical manufacturers. Shell is a leading oil and gas producer in the deepwater Gulf of Mexico. Shell is most visible to the public through its 25,000 Shell-branded gas stations in the US. Through most of Shell's history, its business in the United States, Shell Oil Company was substantially independent; its stock ("Shell Oil") traded on the NYSE, and Shell Group’s central management in London and The Hague had little direct involvement in the running of the American business. In 1984, Shell made a bid to purchase those shares of Shell Oil Company it did not already own (around 30 percent) and, despite some opposition from some minority shareholders which led to a court case, succeeded in the buy-out for a sum of $5.7 billion. During the 1990s, Shell Group became more directly involved in managing the business. In Canada, also previously independent, Shell purchased the shares in Shell Canada that it did not own in order to implement its new global business model in its Canadian operations. Shell Oil Company is an equal partner with the Saudi Arabian government-owned oil company Saudi Aramco in Motiva Enterprises, a refining and marketing joint venture which owns and operates three oil refineries on the Gulf Coast of the United States. It also holds 80 percent of an exploration firm called Pecten that explores and drills in various offshore locations including the oil basin near Douala, Cameroon in cooperation with the French government-owned Elf Aquitaine (now Total). Shell products include oils, fuels, and card services as well as exploration, production, and refining of petroleum products. 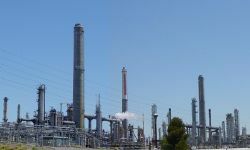 The Shell Oil Refinery in Martinez, California, the first Shell refinery in the United States, supplies Shell and Texaco stations in the West and Midwest. In Australia, Royal Dutch Shell conducts a large range of activities including exploration and the production and commercialization of oil and natural gas; operation two refineries, 19 terminals and 33 depots for the manufacture and distribution of oil products; and marketing lubricants, aviation products, marine oil products, bitumen and chemicals. In 2003, retailer Coles Myer (Coles now part of Wesfarmers, Myer now part of Newbridge Capital) purchased the rights to the retail business from the existing Shell Australia multi-site franchisees for an amount less than A$100 million. This was in response to a popular discount fuel offer launched some years earlier by rival Woolworths Limited. Under the agreement, Coles Express sets fuel and shop prices and runs the business, provides convenience and grocery merchandise through its supply chain and distribution network, and directly employs the service station staff. 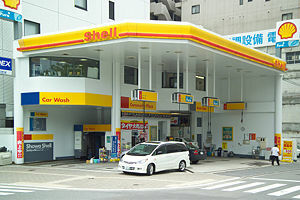 Shell is the exclusive supplier of fuel and lubricant products, leases the service station property to Coles, and maintains the presence of the "pecten" and other Shell branding on the price board and other signage. Through its history, Royal Dutch Shell has been involved in a number of controversies associated threats to the environment and to public health and safety, its business practices and political corruption in some of the countries where it was doing business. In recent decades Shell has acknowledged some of these problems and has promised to take steps to repair damage done both to the affected parties and to its own reputation. These steps included tightening internal controls among its different subsidiaries, an ostensible commitment to corporate social responsibility, an extensive global advertising campaign and other initiatives in the late 1990s and early 2000s. Henri Wilhelm August Deterding KBE (Hon), who served as chairman of the Royal Dutch Petroleum Company and of the combined Royal Dutch/Shell oil company for 36 years, was forced to resign from the company's board in 1937 after he proposed selling a year's oil reserves on credit to the German Nazi party. In Ireland, Shell was criticized, along with Statoil and Marathon Oil, for its plans to pipe unrefined gas from the Corrib Gas Field onshore through a pipeline that would pass close to local residents, en route to a refinery 9 km inland, in northwest County Mayo. The plans were originally made by Enterprise Oil and inherited by Shell when they acquired this company in 2002. The project was dogged by years of opposition before natural gas started to flow from the field in December 2015. In 2018, Shell sold its stake in the Corib Gas Field in 2018, to reduce its debts. .
On April 26, 2000, the United Nations fined the Royal Dutch Shell Group $2 million for shipping Iraqi oil on April 5, 2000, in violation of the international oil embargo against Iraq, on a tanker, the Akademik Pustovoit, that was boarded by American-led naval forces in the Persian Gulf. Royal Dutch/Shell had maintained that the tanker carried only Iranian oil, loaded at the port in Bandar Mahshur. However, a spokesman for the Pentagon, Kenneth H. Bacon, was quoted as confirming that tests on the cargo had determined that 20 percent of it was illicit oil from Iraq. Between 1972 and 1975, the last three years of the Vietnam War, Shell Vietnam (the local operating company of the Shell Group) controlled half of Vietnam’s oil supply. According to a book by the President of Shell Vietnam during that period, Louis Wesseling, Fuelling the war: revealing an oil company’s role in Vietnam Shell failed properly to control the oil shipments which flowed through indirect channels to the Vietcong. Shell knowingly employed as a manager a notorious former senior police official with a “fearsome and well-deserved reputation” who “had already shown his inclination to settle security matters by military action with little compunction about killing, innocents along with suspects.” Wesseling later served as CEO of Shell companies in South America and the Middle East and collaborated on drafting the "Shell Group Business Principles." Shell operates a joint venture with the government in Nigeria under the name Shell Petroleum Development Company (SPDC). The Nigerian government and Nigerian political leaders have profited from the exploitation of oil in their country but have done very little to benefit the people in the areas where oil is produced, who continue to live in dire poverty. Shell, along with other oil companies, is often criticized for failing to use its considerable interest in Nigeria to bring about change in the Niger delta. Militant rebels in the Niger Delta pose a direct threat to oil production facilities there and frequently stage acts of sabotage. In the early 1990s, Ken Saro-Wiwa, president of the Movement for the Survival of the Ogoni People (MOSOP), led a non-violent campaign against environmental damage associated with the operations of multinational oil companies, including Shell and British Petroleum, in the Ogoni homelands of the Niger delta. In January 1993, MOSOP organized peaceful marches of around 300,000 Ogoni people (more than half of the Ogoni population) through four Ogoni population centers, drawing international attention to his people's plight. That same year, Shell ceased operations in the Ogoni region. In 1995, when Ken Saro-Wiwa and eight others were executed on trumped-up charges of treason, much of the world-wide condemnation of the act was aimed at Shell, which was implicated by its association with the Nigerian government's activities. Shell was challenged by Greenpeace over plans for the undersea disposal of the Brent Spar, an old oil transport and hub station located in the North Sea, in the North Atlantic. 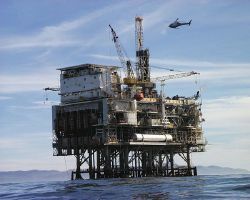 Shell eventually agreed to disassemble it onshore in Norway, although it has always maintained that its original plan to sink the platform was safer and better for the environment. Upon its disposal, the Greenpeace estimates of toxic content were found to have been inaccurate. The controversy over the exaggeration of Shell’s oil and gas reserves resulted in the resignation of the then chairman Sir Philip Watts, and the departure of the head of the Exploration and Production business Walter van der Vijver and the CFO Judy Boynton. 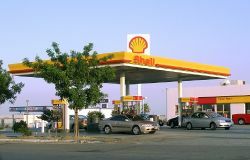 A number of shareholders, including a group of Dutch pension funds allegedly holding about 5 percent of Shell's shares , German and Luxembourg institutional shareholders, the Pennsylvania State Employees' Retirement System and the Pennsylvania Public School Employees' Retirement System, initiated law suits alleging that, based on the false reports, the value of Shell’s shares had been overstated in the stock markets. Sakhalin-II is an oil and gas project led by Shell on Sakhalin Island in Russia that involves the piping of oil and gas to an oil terminal and the construction of Russia's first liquefied natural gas LNG plant. The project has been controversial from the start because of its cost, environmental consequences and impact on the community. In the summer of 2005, Sakhalin Energy, the project operator, doubled its estimated capital costs to around $20 billion and LNG production was delayed until 2008. Allegations of environmental violations and criticism from Russian environmental regulators threatened to halt the scheme and land the shareholders with penalties. Western conservation groups were concerned because the project involved putting equipment close to the breeding grounds of endangered grey whales, and dumping of waste near sensitive salmon fishing areas.At the end of November, 2005, the Chief Executive of WWF said that the project would have a "negative impact on Sakhalin's people and environment." These concerns impeded the efforts of Shell and the other consortium partners to seek financing for the project from the European Bank for Reconstruction and Development (EBRD). In September, 2006, the European Commission fined Shell US$137m for their role in a cartel that fixed the price of bitumen. In January 2006, Royal Dutch Shell Plc agreed to a $300,000 settlement of allegations that two of its subsidiaries, Shell Trading U.S., located in Houston, and London-based Shell International Trading and Shipping, engaged in “fictitious crude oil futures trades on the New York Mercantile Exchange.”  Another subsidiary, Coral Energy Resources, paid US$30 million in July, 2004, to settle accusations that it submitted false price data to publishers in an attempt to manipulate the price of natural gas futures. Much of Shell's public relations initiative emphasizes its embryonic renewable energy business, though it remains a relatively small business compared to the core hydrocarbon extraction, processing and marketing operations. Shell is researching ways to reduce the impact of oil processing and usage on the environment, such as capturing CO2 from power plants and refineries and storing it safely underground in old oil and gas reservoirs. Shell's response to the problems of Brent Spar and Nigeria was to launch an internal review of processes and an external communications campaign to persuade stakeholders of their commitment to corporate social responsibility. In response to criticism of its track record on environmental matters Shell published an unequivocal commitment to sustainable development, supported by transparent and honest reports. Shell Chairman Philip Watts gave a 2003 speech in Houston calling for skeptics to get off the fence and take action to stop global warming "before it is too late." Shell is also a founding member of the World Business Council for Sustainable Development, which Watts led as Chairman in 2002-2003. Shell operates a number of programs both on the local and corporate levels to make positive contributions to society. It provides education and training to prepare local students for careers in the oil and energy industries, and seeks to hire employees and purchase materials locally in order to contribute to community development. Shell cooperates with NGOs (non-government organizations) to create development programs in the countries where it operates, and invests in small businesses concerned with sustainable energy, climate change, and biodiversity. For more than 21 years, Shell's LiveWIRE initiative has encouraged young people to start and develop their own businesses in the UK and 25 other countries . The Shell Centenary Scholarship Fund (TSCSF), established in 1997, offers approximately 90 scholarships annually to allow postgraduate students from developing countries to study in the United Kingdom and the Netherlands, and gain skills that will make a long-term contribution to the further development of their countries. The Shell Foundation, established by the Shell Group in 2000, as an independent charity registered in the U.K., seeks to use business know-how, management tools and assets to tackle global problems. ↑ No. 32346 The London Gazette (Second Supplement), June 4, 1921. Retrieved April 8, 2019. ↑ Shell shareholders approve merger BBC News, June 28, 2005. Retrieved April 8, 2019. ↑ The history behind the Shell logo Retrieved April 8, 2019. ↑ Marcel Knobil, Business Superbrands (The Brand Council, 2000, ISBN 0952815346), 93. ↑ Honey Garcia, Oil & Gas Giant to Build Dutch Borssele III & IV Offshore Wind Farms Offshore Wind, December 12, 2016. Retrieved April 8, 2019. ↑ Jared Stonesifer, Royal Dutch Shell announces plans to combat climate change The Times, November 30, 2017. Retrieved April 8, 2019. ↑ Energy from Deepwater Shell U.S. Retrieved April 20, 2019. ↑ Martinez Refinery Shell U.S. Retrieved April 20, 2019. ↑ Stephen Howarth, A century in oil: the "Shell" Transport and Trading Company, 1897-1997 (London: Weidenfeld & Nicolson, 1997, ISBN 0297822470), 327. ↑ Colin Gleeson, Shell counting the cost as sale of Corrib gas field completed The Irish Times, November 30, 2018. Retrieved April 22, 2019. ↑ Union Carbide vs. Shell Retrieved April 22, 2019. ↑ Jiffy Lube Agrees to Settlement over Surcharges The New York Times, December 4, 2003. Retrieved April 22, 2019. ↑ Stephen Lee Myers, Fining Shell, U.N. Concludes That Tanker Carried Iraq Oil The New York Times, April 26, 2000. Retrieved April 22, 2019. ↑ Louis Wesseling, Fuelling the War: Revealing an Oil Company's Role in Vietnam (London: I B Tauris & Co Ltd, 2000, ISBN 978-1860644573). ↑ Stephanie Silber, Environmentalists under fire defending those who give the earth a voice (Washington, DC: Amnesty International, Sierra Club, ©2000). VHS video. ↑ Erik Ipsen, Shell Gains Despite Currency Fiasco The New York Times, February 26, 1993. Retrieved April 22, 2019. ↑ DNV Inventory, Contents of Brent Spar, relative to quantities in the North Sea, as detailed by Det Norske Veritas Brent Spar Dossier Retrieved March 29, 2019. ↑ Dominic White, Shell drops 'bombshell' on reserves Telegraph.co.uk, January 9, 2004. Retrieved April 23, 2019. ↑ ORDER INSTITUTING CEASE-AND- DESIST PROCEEDINGS PURSUANT SECTION 21C OF THE SECURITIES EXCHANGE ACT OF 1934, MAKING FINDINGS, AND IMPOSING A CEASE-AND-DESIST ORDER SEC, August 24, 2004. Retrieved April 24, 2019. ↑ Shell sued by Dutch pension funds BBC News, January 9, 2006. Retrieved April 24, 2019. ↑ Final Notice Financial Services Authority (August 24, 2004) p11: para60. Retrieved April 24, 2019. ↑ Shell settles fraud case for $150M CNN Money, August 24, 2004. Retrieved April 24, 2019. ↑ 24.0 24.1 Sakhalin issues 'settled' - as Russia takes 50% stake, Sakhalin issues 'settled' - as Russia takes 50% stake The Guardian(UK), December 22, 2006. Retrieved April 24, 2019. ↑ Raf Casert, EU Fines 14 Companies Over $340 Million Houston Chronicle, September 13, 2006. Retrieved April 24, 2019. ↑ U.S. Commodity Futures Trading Commission Assesses Penalties of $300,000 Against Shell-Related Companies and Trader in Settling Charges of Prearranging Crude Oil Trades U.S. Commodity Futures Trading Commission, January 4, 2006. Retrieved April 24, 2019. ↑ CORAL ENERGY PAYS $30 MILLION TO SETTLE U.S. COMMODITY FUTURES TRADING COMMISSION CHARGES OF ATTEMPTED MANIPULATION AND FALSE REPORTING U.S. Commodity Futures Trading Commission , July 29, 2004. Retrieved April 24, 2019. ↑ Nick Mathiason, Green Groups act to halt Shell Plans The Observer, April 29, 2007. Retrieved April 24, 2019. ↑ Carbon Capture and Storage Projects Shell.com. Retrieved April 24, 2019. ↑ Sustainability reports Shell.com. Retrieved April 24, 2019. ↑ Terry Macalister, Shell chief delivers global warming warning to Bush in his own back yard The Guardian, March 12, 2003. Retrieved April 24, 2019. ↑ Shell LiveWIRE? Retrieved April 24, 2019. ↑ Shell Centenary Scholarship Fund Retrieved April 24, 2019. ↑ About Shell Foundation. Retrieved April 24, 2019. Cummins, Ian, and John Beasant. Shell shock: the secrets and spin of an oil giant. Edinburgh: Mainstream Pub., 2005. ISBN 184018941X. Howarth, Stephen. A century in oil: the "Shell" Transport and Trading Company, 1897-1997. London: Weidenfeld & Nicolson, 1997. ISBN 0297822470. Jonker, Joost, J. L. van Zanden, Stephen Howarth, and K. E. Sluyterman. A history of Royal Dutch Shell. Oxford: Oxford University Press, 2007. ISBN 978-0199298778. Knobil, Marcel. Business Superbrands. The Brand Council, 2000. ISBN 0952815346. Sampson, Anthony. The seven sisters: the great oil companies and the world they shaped. New York: Viking Press, 1975. ISBN 978 0553234695. Silber, Stephanie. Environmentalists under fire defending those who give the earth a voice. (Washington, DC: Amnesty International. Sierra Club, ©2000). VHS video. Wesseling, Louis. Fuelling the war: revealing an oil company's role in Vietnam. London: I.B. Tauris, 2000. ISBN 1860644570. History of "Royal Dutch Shell"
This page was last modified on 24 April 2019, at 22:36.